Horror stories are not my thing and can't really say that graphic novels are for me either but if I had to pick one over the other, I'd definitely go with Seth's. I have been meaning to read some of Neil Gaiman's books for a long time now, but I think I will start with a different one. The Sandman started as a horror comic, and if it had stayed that way, it probably would be mostly forgotten today. The further it gets from Morpheus as a protagonist (and he rarely is), the better it tends to get. 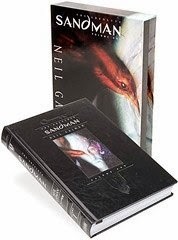 The Sandman is far and away Neil Gaiman's strongest work, with is children's books coming in second. I know people love his novels, but they don't have the same kind of vision or sense that he's in control of the material and in command of the format. Wanda: With all the technology out there, maybe Smith and Cooper could make it a reality. Barbara: I still haven't tried a novel of his, but at this point, I think I'm safe to say that I can take him or leave him. August: I'm not so sure if it'd been forgotten had it stuck to the horror themes. There's a lot of horror that has stood the test of time, and I think I prefered that aspect of the book rather than the mythology/fantasy that started to creep in. There's nothing wrong with horror as a genre, it's just that Neil Gaiman ultimately isn't as good at it, and the horror aspects weren't a very big part of why The Sandman became this big groundbreaking acclaimed phenomenon. It was Hellblazer and Swamp Thing that were really blazing trails for horror. Even the Sandman stories that seem like horror on the surface (The Collectors, for example, about the serial killers' convention) are really about how and why we create myths. Preludes and Nocturnes is probably the only time the book could ever have been truly called a horror comic. But don't worry, with the possible exception of A Game of You (the weakest arc in the series, imho), all the best stuff starts with Season of Mists, when Gaiman hits his stride. lol, OMG John, .. Let's hope not! !